Image caption Jorge Zelada was responsible for Petrobras's international division. A former director of the Brazilian state-owned oil company Petrobras has been sentenced to twelve years in prison, as part of a huge investigation into bribery and corruption. Jorge Zelada, who ran Petrobras's international division, was convicted of money-laundering and corruption. Another Petrobras manager, Eduardo Costa Musa, and two others were also jailed. The men were paid millions of dollars in bribes by a Petrobras contractor. The investigation also found that Jorge Zelada had transferred huge amounts of money offshore into bank accounts he owned in China. Mr Zelada was arrested in July and has been held in a prison in the city of Curitiba in southern Brazil. He was accused along with Mr Musa of accepting a $30m (£20bn) bribe to favour a contract in 2009 with the company Vantage Drilling Corporation. The contract was to freight a drill ship, Titanium Explorer, to Petrobras. Mr Zelada's lawyer says he will appeal against his client's sentence. More than 100 people have now been arrested in the two-year investigation, including politicians and former top executives at Petrobras, and some of the country's biggest construction firms. The scandal has rocked Brazil's governing Workers' Party, with top politicians accused of taking bribes. But President Dilma Rousseff, who chaired Petrobras when much of the corruption is believed to have taken place, has been cleared of involvement. Petrobras' investments alone represent 2% of Brazil's gross national product, and its downturn has harmed a national economy struggling as a result of low commodity prices. 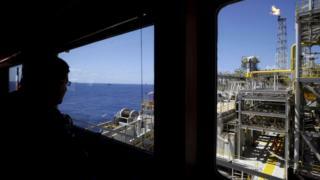 The corruption scandal has cost Petrobras over $16bn, including $2bn that went straight to corrupt executives and firms.